« #SpokesComp 2018 – Cycling Lives Transformed!! With over 150,000 Edinburgh and Lothians Spokes maps sold since the first editions, our maps have an enviable reputation. Not only can they be found in the rucksacks, panniers and bookshelves of thousands of individuals, but also pinned onto workplace staff noticeboards, on the desks of Council transport officers, in school projects and for a myriad other purposes. 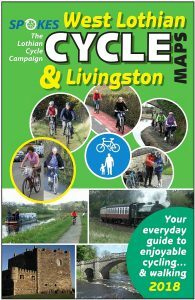 As with our Edinburgh and Midlothian maps, Spokes is donating remaining supplies of the old West Lothian edition to schools for educational purposes. Again, the range of possible uses is tremendous, as in our letter to schools – and of course this also introduces Spokes maps to literally hundreds of young people most of whom would otherwise probably never know of them. 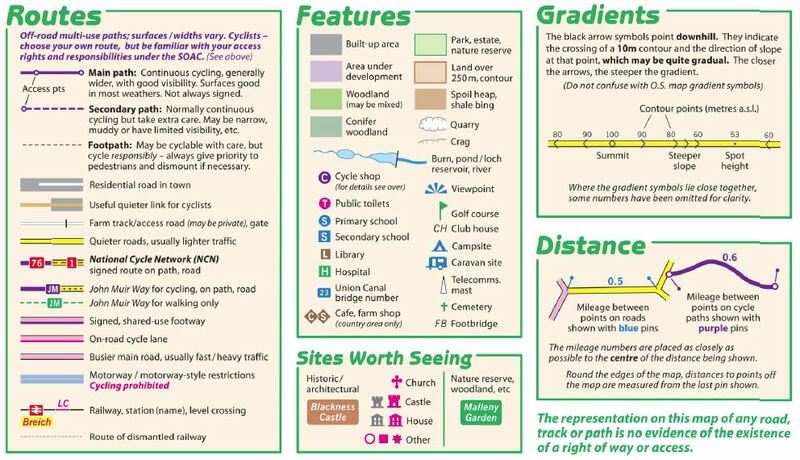 Whilst digital maps have become ubiquitous, sales of Spokes paper maps remain good, with many people finding it useful to have both options – the paper map being particularly valuable for seeing how local rides and routes fit into the wider area. 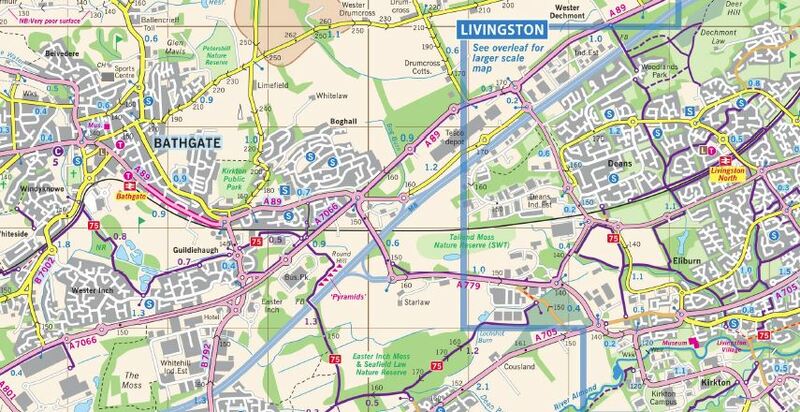 The 2018 West Lothian edition – our 4th – is the first to be printed on water-resistant and tear-resistant paper, an innovation which has already proved very popular with our latest Edinburgh and East Lothian maps. 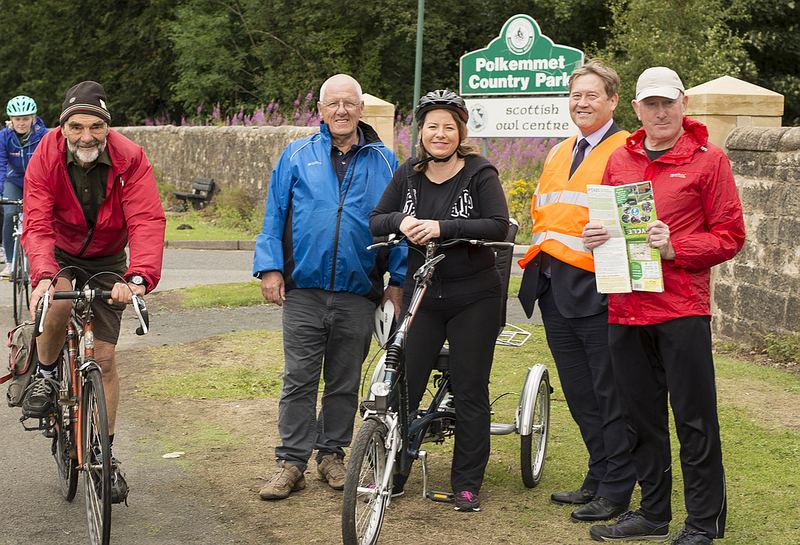 We were delighted that Council Depute Leader Cllr Kirsteen Sullivan came along to launch the map, as part of a wider event which also highlighted Sustrans-funded routes and the excellent and innovative West Lothian Bike Library. The Bike Library offers a wide range of bike-related services – hire, repair, training, support, e-bikes, inclusive bikes – to help as many people as possible get active, for fun and for useful transport. 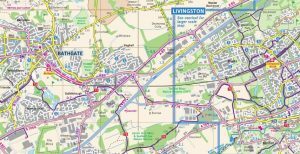 The Council’s press release is here and they are also to feature the map in a forthcoming edition of the Bulletin, which goes to every house in West Lothian. Producing a new map edition is a huge undertaking for a voluntary organisation, if it is to be a quality product which fully and accurately reflects the latest developments on the ground. In the past, almost everything, from surveying to artwork, was done by Tim Smith and Peter Hawkins, a massive amount of work even for the most dedicated individuals. So for this edition we tried a new approach, to lessen the ‘central’ burden, and also more in keeping with our general philosophy of involving local members whenever possible. An extract from the main map. Click for an enlargement, but note that it is low resolution. The printed map is very high resolution. All local members were asked if they would like to help with surveying, and there was a great response. 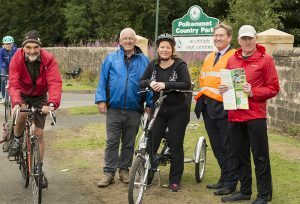 Eric Ingram from Livingston and Anne Douglas from Balerno coordinated the volunteers, so that every km square on the map was covered. Tim Smith has written a fascinating and detailed description of the process, How The West was Done, which includes credits to the individuals involved. The maps are always sold at a discount price at Spokes stalls – for example at community festivals or at our public meetings. If you are willing to be a distributor for the map to bikeshops, bookshops, newsagents or other outlets in a West Lothian town or West Edinburgh area, please email maps @ spokes.org.uk.